You're running an older IE version. Please update it! Create your free online course now. You'll be able to create tasks, upload files, and grade assignments. Teachstars lets you stay in control of your classroom everywhere you are, 24/7. It's a platform for the new generation of digital teachers. You are frustrated by existing Learning Management Systems. You'd love to use something that felt more natural, friendly and efficient. We've got your back. Teachers and students deserve to enjoy an amazing user experience. And it's time someone designed a tool that made our lives easier. We've created a stress-free set of tools to make teaching & learning more fun. Get free classroom sites, an online gradebook, and your daily dose of happy. Register for a free or paid account. Start by creating your first course. how many points they're worth. Share your course's URL with students. 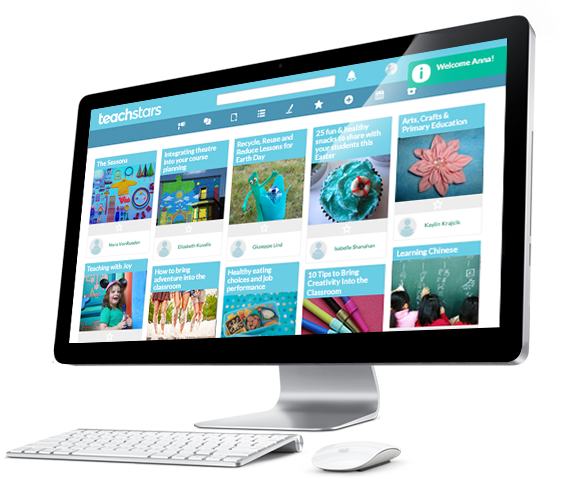 Teachstars is the online platform that will replace classroom stress with inspiration. Combining engaging editorial content and a set of powerful online class management tools, Teachstars is a toolkit to transform teachers' lives. Build your own online course and invite your students to check out your content and assignments. Healthy habits, inspiration, creativity, humor, happiness, entertainment and plain teacher fun. Connect, grade and publish assignments with a user-friendly LMS that values you. We'll provide you with an engaging profile that will wow your students & potential employers. Publish interesting multimedia content that engages your students even further. We make it easy. Create multiple choice quizzes with automatic grading or design an open-ended test to validate learning. Stay on track with our friendly email notifications. You and your students will never miss an important date. Enjoy clarity of mind with a simple, user-friendly calendar that displays all pending assignments and tasks. We've been developing this amazing tool for several years now. Teachstars 2015. All rights reserved.